Jewel Of The Seas departing Amsterdam at the 1st of july 2005, as seen from the balcony of the Amsterdam port office overlooking the city harbour. Jewel Of The Seas is the final member of the Vantage class, following her sisters Radiance Of The Seas, Brilliance Of The Seas and Serenade Of The Seas. Like her sisters, she measures some 90.090 tons, has a lenght of 293,20 meters, a width of 32,20 meters and a draft of 8,1 meters. On her 12 decks, there is capacity for 2501 passengers maximum, on basis two-per-cabin the number is 2112. She also has space for 859 crewmembers. The ship was built at the Jos L. Meyer wharf in Papenburg, northern Germany as yardnumber 658, where her keel was laid at the 9th of november 2002. When she started services, she flew the flag of Liberia with her homeport being Monrovia. Later, this was changed to the Bahamas because of the political unrest in Liberia at the time. At the 4th of april 2004, the ship floated out her building dock and as overhauled to the Eemshaven in the northern part of The Netherlands to be completed. The Vantage class ships were the largest ships that were ever fitted out in The Netherlands at the time and the normally deserted Eemshaven was in desperate need of work. 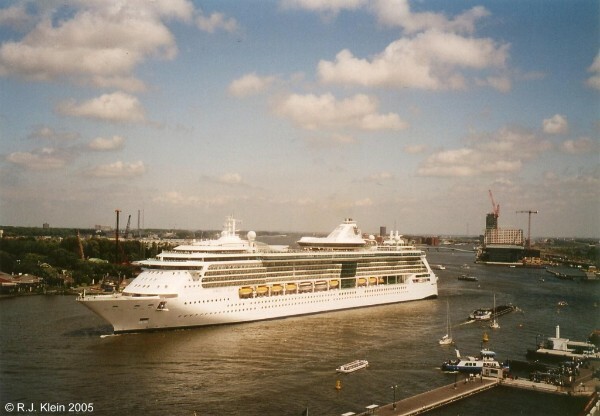 At the 22nd of april, Jewel Of The Seas was delivered to the company and sailed for Southampton, where she was named by Kathy Mellor at the 7th of may 2004. Earlier that year, Kathy Mellor was given the honour to become 'American National Teacher of the Year 2004' and because of this title, she had the opportunity to act as a godmother for the newest Royal Caribbean ship. Jewel Of The Seas seen sailing the Northsea Canal from Amsterdam at the 19th of april 2008. Clearly, her rounded lines can be seen. The ship is known for her spaciousness in contradiction to other ships in the fleet of Royal Caribbean, even her sisters. Her decor is also quite sophisticated, resembling ships that are more in the upper market. This is also the reason why Jewel Of The Seas attracts more experienced cruisers then the other ships within the fleet. She also undertakes longer cruises then normal, normally European cruises in summer and cruises from ports like Boston or Miami in winter. The ship has a very sleek design and is, in my opinion, one of the most great-looking modern cruiseships sailing nowadays. Her rounded lines and good proportions give her just that extra touch. The ship is driven by a powerfull gas turbine engine, that is very environmentally friendly and gives her a topspeed of around 25 knots, much faster as then standard cruiseliners. The ships Centrum, called Atrium at other lines, is a very bright space, where two enclosed waterfalls give the perfect atmosphere. At the marble floor, live music is played as well as acrobatic cocktail demontrations by her bartenders. Beyond the Centrum, the ships offer a very nautical, almost traditional feel as they are decorated with dark-wood paneling, caramel and light colours and sea-blue carpets.Around half of the ships sides is made of glass, so the passenger has a real feeling of being at sea. This seems normal for a ship, but most modern cruiseliners are very inside-orientated. That is the place where the money has to be spent after all. Jewel Of The Seas set sail for her first European cruiseseason, taking of just after she was named. On the 28th of september of her first year, she had the misfortune to collide with a whale while cruising off Newfoundland and the animal had to be pulled off her bow when she was in port. During 2010, the ship had several outbreaks of Norovirus aboard, and several hundreds of passengers were affected. Another small misfortune stroke the ship at the 6th of september 2012, when she collided with an overhanging cable at the port of Klaksvik on the Danish Faroe Islands. One crewmembers was injured when he was hit by falling debree and damage was also done to the mast and some of the equipment attatched to the mast.